Scott City, Kan. (westernkansasnews.com)–In recent history, Scott City has sent athletes to Fort Hays State to compete for the Tigers in a variety of sports. And they have gone on to have successful careers in Hays. You can add one more to the list that has signed on to be a Tiger. 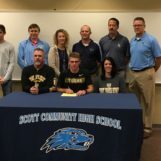 Jack Thomas has recently inked his letter of intent to run cross country and track at Fort Hays State University. Thomas’ high school career has been impressive. He has won two individual titles, including winnning the 3200M run as a freshman in Class 3A in a photo finish, and won the Class 3A State Cross Country meet as a junior last year in Lawrence. His peak performances came as a sophomore when he ran a 9:34 3200M run in the Class 4A state meet, and as a junior, was undefeated in cross country, with his best run being at 16:04, while leading the Beavers to a third place team finish in 3A in 2017. He also has helped the track team over the past three season win Class 3A in 2016 and 2018 and a third place finish in Class 4A in 2017. Last Spring, Thomas was dealing with an injury, and was limited to one race, where helped the 4x800M Relay team win the 3A race. He was out this past fall after having surgery earlier in the summer, and is on the path to recovery to run track this spring.